Last night before going to bed, I went outside to see if there were any clouds in the night sky with the hope that if there were, then there would be a good chance for a colorful sunrise in the morning at Leesylvania State Park, and there were very puffy clouds in the moonlit sky. So, I got my camera gear ready and set the alarm clock for 0530. 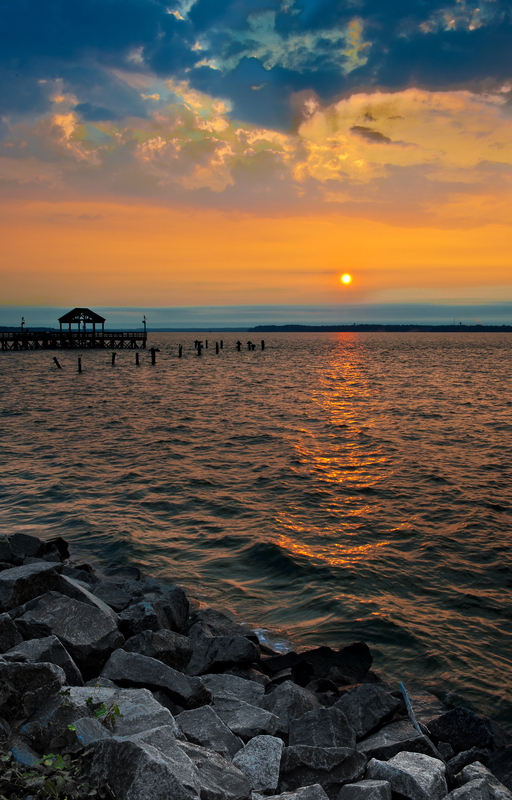 Leesylvania is one of my favorite locations for shooting sunrises, because it is close to home (10 minute drive) and on the Potomac River with a perfect view east toward Maryland across the river. I woke up at 0500, and rather than wait for the alarm, got up and went outside to check the sky, and again I could see clouds. I got excited because I knew there was now a very good chance for a colorful, photographic sunrise. I arrived at the park before sunrise, went to my usual location along the river, and set up my camera on my tripod along with a Nikon 24-70 lens and shutter release since the images were going to be long exposures. I did not have to wait long as the sky across the river began to gradually brighten, and then begin to glow a bright orange. The clouds were perfect. The colors intensified quickly as the bright glow of the sun began to appear and quickly rose above the horizon through the clouds. It was gorgeous, and as the sun rose, the sky became more and more orange, as well as the river below. It was definitely worth getting up early to witness and capture digitally. Below are two of the images. 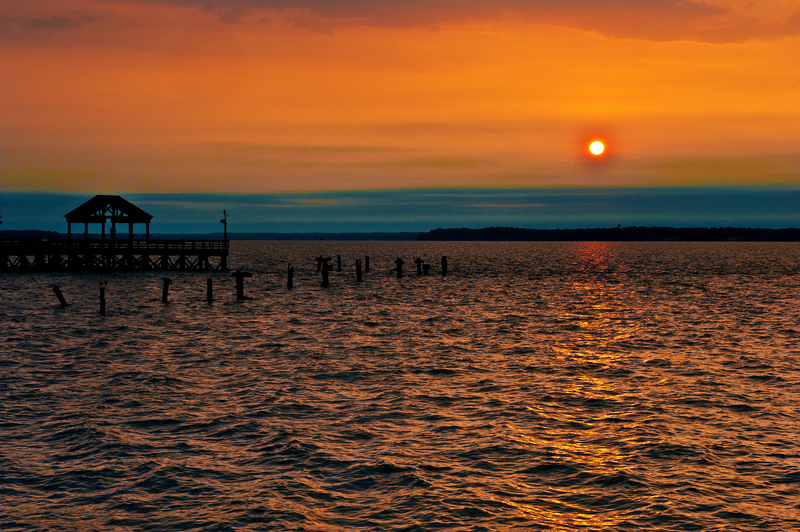 This entry was posted in Landscape Photographs and tagged sunrise. Bookmark the permalink. The one with the rocks is your best-ever photograph, Steve…I see a cross and some angels in the clouds, and I love the colors! Thank you Betty! It was a beautiful morning, and I was fortunate to be there to witness and capture it. Wow! These photos are gorgeous and make getting up so early worth it for sure!!! !